Until a few months ago this is how JCPenney’s prices looked like. I show actual numbers in this chart for one product but you can take that model and apply to all their SKUs. Lots of red bars. Starting with a high price with many discounts applied to it, leading to a low pocket price. Sales, coupons and free cash were the only way they were bringing shoppers into the store. All these meant signficant price leaks. When the entire marketing strategy is based on discounting and coupons the word waterfall assumes literal meaning. When their CEO, Mr. Ron Johnson, of Target and Apple fame, took over he decided to plug all those pricing leaks. Within a few weeks of taking over he put an abrupt end to this practice by going to what they branded as “Fair and Square” pricing. No more markdowns, sales, coupons to clip or cash backs – one price. As I have written before, effective pricing requires effective pricing communication. By branding the new pricing strategy (Fair and Square), changing the JCPenney logo to square and by running social media and Ad campaigns (some of which made it look like coupon clipping is a pain-point for customers) JCPenney did all the right things with their change. All is well in the retail land? Did the Apple retail store magic rub-off on JCPenney? JCPenney’s stock has taken a beating, dropping 20%, since it announced its last quarter earnings. Its revenue dropped 19%. Just for this quarter it reported a loss of $160 million. Was it a bad decision to give up on discounting and move to Fair and Square pricing? Are the pundits right about pricing, that lower prices and greater service are the ways to profitability? Before the knives come out against the pricing move, ask this key question. Where do you start for addressing your pricing problems? This is not new to you if you have been reading my blog. I posed this question and answered it some time back. To set or change pricing you start with your target customers and understand why they are hiring your product. 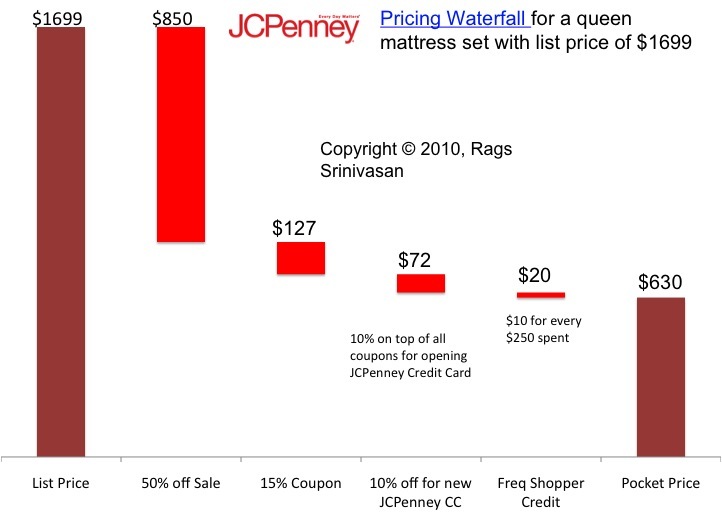 In the case of JCPenney, they had a perfect execution of pricing change skipping this first step. Johnson hasn’t clearly defined who his target customers are and how he can get them to shop at J.C. Penney, says Craig Johnson, an industry consultant. If you do not know your target segment (they likely are not Target’s or Apple’s segment and likely are not hiring JCPenney for reasons they were hiring Target or Apple) you cannot change your pricing strategy. You can apply pricing tactics or tweak it but not set your entire strategy. What does this mean to you as a marketer or a startup founder? I see several popular articles extolling the virtues of increasing prices and starting with higher prices. After all, “more money from fewer customers“, seems to make sense. Before you go down this path, take a lesson from JCPenney. Don’t touch the pricing dial before you understand your customers and their needs.